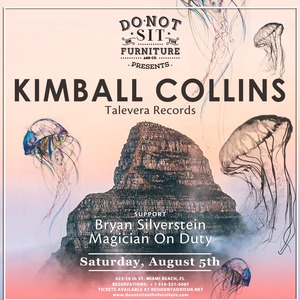 Saturday, August 5th, Do Not Sit On The Furniture presentsKimball Collinshttp://www.kimballcollins.com/https://soundcloud.com/kimballcollinsSupport by:Bryan SilversteinMagician On Duty********************************************************************Interviews with Kimball“Further Future” - in depth interview and exclusive music mix for eventhttp://furtherfuturist.com/ff002-volume5/exclusive-interview-01/Mixmag Asia Featurehttp://mixmag.asia/read/introducing-underground-essentials-by-kimball-collins-features"Purveyor of music and all its bliss... "DJ/Producer Kimball Collins is upfront, on it and always a few steps ahead of us. That’s what makes hearing him fun. He’s still the pioneer for discovering and debuting some of the most progressive styles of forward-thinking music. You can feel his contagious rush of excitement affect the dance-floor as he layers tracks of several genres into one cohesive set. Taking you on a joyride in the newest sounds from dusty playas, exotic lands, romantic castles, sci-fi synth labs to the bass-heavy melodic techno chambers… you know he’s pushing that envelope farther into the future.